Imagine you are sitting at your computer (which you are) and are about to complete a task such as such writing an email to a friend or analyzing some data using a spreadsheet. Such tasks would seem rather routine, but through the eyes of Brenda Laurel, they might be conceived as subplots in the drama of life. In “The Six Elements and the Causal Relations Among Them” and “Dramatic Interaction in a Small World,” Laurel considers how human-technology interactions could be conceived in theatrical terms. 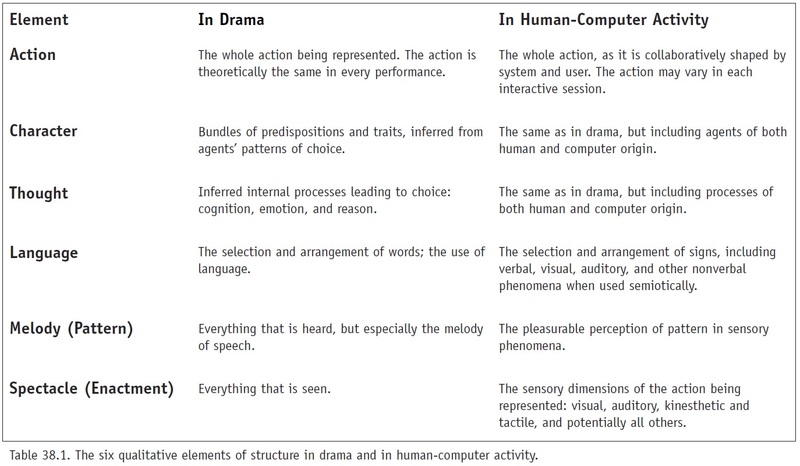 By using Aristotle’s sixth elements of structure in drama (below), Laurel takes us on a thought exercise in how drama can be used to describe the elements of human-computer interaction. While I have yet to be convinced of the inherent value of the framework, the notion that our interaction with technology can be thought of as an “organic whole” – where “form and structure can approach that of natural organisms in the way the parts fit perfectly together” (p. 570) – does provide a vision for a perfect human-technology symbiosis. Source: Brenda Laurel (2003) “The Six Elements and the Causal Relations Among Them.” In The New Media Reader, MIT Press, p. 565. If my interaction with a computer can be thought of in a theatrical way, my question is who is writing the script? I’d like to think that I control the script and that the computer enables my acting by perfectly responding to, perhaps anticipating, my every move in a free flowing form of interaction. At some level this is true. For example, my computer just told me that I misspelt “ineraction.” However, it is also true that my interaction with a computer is constrained by the limitations of the computer and its programs. This makes me wonder whether the very structure of a computer platform will dictate, at a meta-level, the scope of the script and the drama that unfolds. One is reminded of “the architect” in the Matrix and whether the writers of that script were on to something. Reading your comments, I immediately thought not of script but of improvisation… perhaps no one is writing the script. Or perhaps the script is merely the starting point – and at the point where the programming limitations fail to meet our needs, we improvise. Or when we receive a response from the machine that we did not expect. So this is somewhat counter to Laurel’s thinking, I suppose, where everything is meticulously thought-out and playing nicely together to preserve the whole. But the role of improv is powerful – and perhaps more realistic…?